Ian Williams is the author of Personals, shortlisted for the Griffin Poetry Prize and the Robert Kroetsch Poetry Book Award; Not Anyone’s Anything, winner of the Danuta Gleed Literary Award for the best first collection of short fiction in Canada; and You Know Who You Are, a finalist for the ReLit Prize for poetry. He was named one of ten Canadian writers to watch by CBC. Williams is currently assistant professor of poetry in the Creative Writing program at the University of British Columbia. He completed his doctorate in English at the University of Toronto under George Elliott Clarke. In 2014-2015, he was the Canadian Writer-in-Residence for the University of Calgary's Distinguished Writers Program. He has held fellowships or residencies from Vermont Studio Center, the Banff Center, Cave Canem, and the National Humanities Center. Born in Trinidad, Williams grew up in Brampton, Ontario, and worked in Massachusetts and Toronto before moving to Vancouver. From the pages of The Walrus…a poem by Ian Williams! Have you heard of Ian Williams? You will. 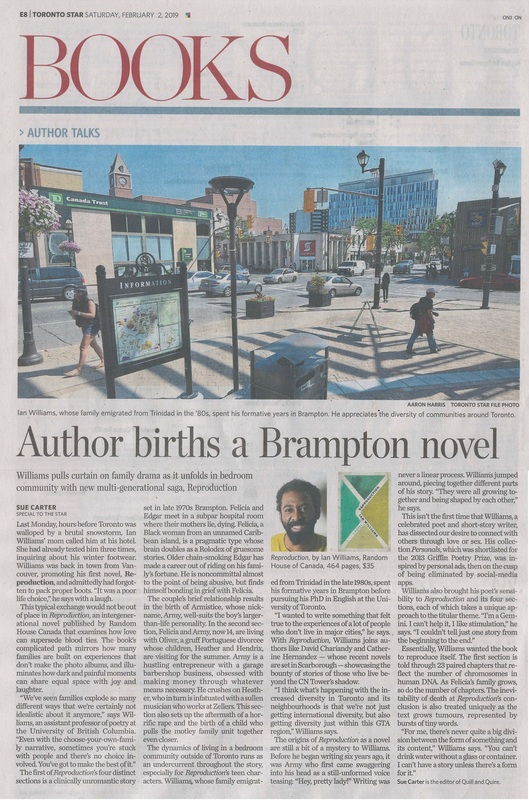 CBC Books calls Williams one of "six…Black Canadian writers on the rise"